Is that an Echo Dot in your chassis, or are you just glad to see me? 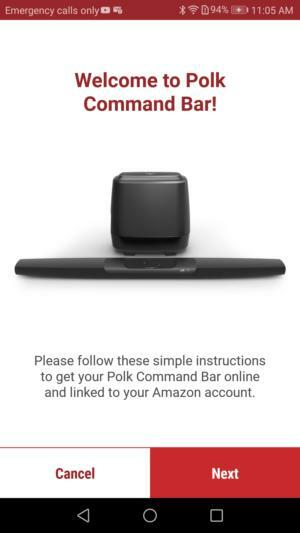 To answer the question posed in the subhed, no, Polk didn’t create the Command Bar by taking a hole saw to the middle of its chassis and dropping an Amazon Echo Dot in there. But the feature is unquestionably designed to look like that, and this soundbar does support Amazon’s Alexa digital assistant. Soundbars are hot these days, and they run the gamut from sub-$100 cheapies to the ludicrously priced, but wow-it’s-impressive Creative X-Fi Sonic Carrier. Polk is going after the better-than-entry-level market with this $300 speaker. That makes it $100 cheaper than the recently reviewed Sonos Beam, and it comes with a nicely matched subwoofer. That’s not too shabby. 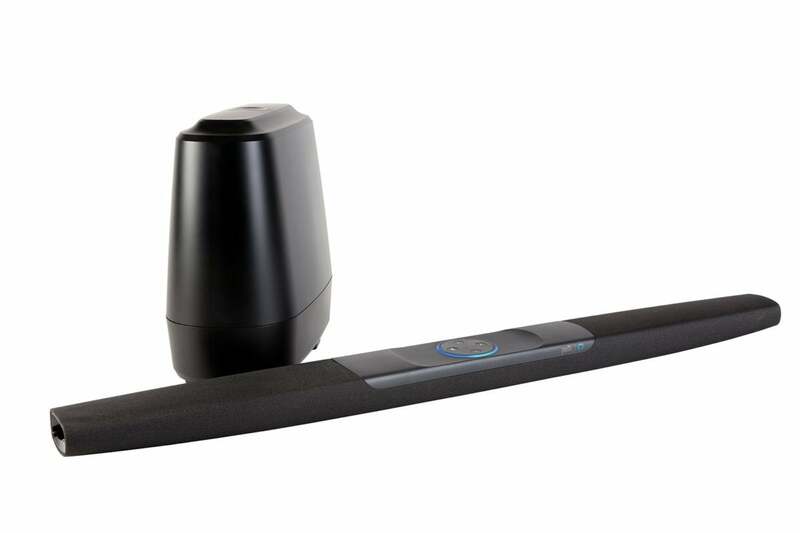 Like the Beam, the Command Bar can be controlled by voice command, but that feature isn’t uber reliable while the speaker is producing its own sonic vibrations. Turn the volume down a bit and Alexa works as well as it does in any other incarnation. That should come as no surprise to anyone who’s used a smart speaker. The Command Bar comes in basic black, measures 2 inches high, about 43 inches wide, and 4 inches deep. The soundbar half of the system—housing two 1.25- by 3.25-inch midrange/woofers and a pair of 1-inch tweeters driven by a 160-watt Class D amp—weighs in at just about 5 pounds. A pair of keyholes on the back allow it to be hung on the wall without need of additional brackets, though the screws (which are not provided) should probably be secured to studs for safety. Polk thoughtfully mounted the USB port sideways, so you can fit a full-sized USB streaming dongle without it interfering with the placement of the unit. A ported, powered (100 watts from another Class D amp) subwoofer with a 6.5-inch driver automatically pairs with the soundbar via Bluetooth when you set it up. The sub measures approximately 14.4- by 7.4- by 14.5-inches and weighs in at 8.65 pounds. Most of the speaker’s connectivity offerings are recessed into the center back of the unit: An HDMI input with 4K HDR pass-through, HDMI with ARC (audio return channel), and Toslink optical input. There’s a second HDMI input on the speaker’s right-hand end cap (if you’re looking at the speaker from the back). You can’t see it in the picture below, but there’s a USB port to the right-hand side of the recess, mounted at a 90-degree angle. 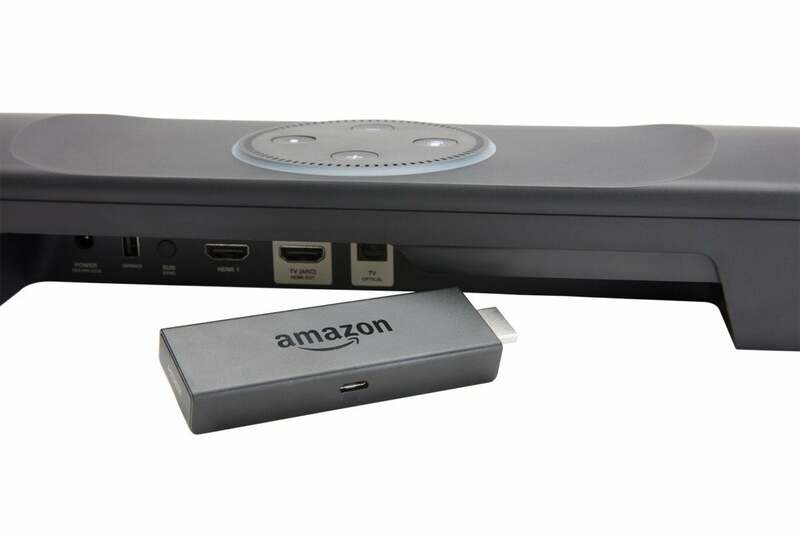 This let’s you attach a USB streaming dongle, such as the Amazon Fire TV stick, in a location where it’s unlikely to get knocked around with day-to-day use. That’s a thoughtful design touch. On top of the unit is the increasingly familiar Alexa circle of light that becomes active when you summon Amazon’s digital assistant: The ring glows orange during setup, red when you turn the mic off, pulsing yellow when there’s a message or notification waiting for you, shades of blue while Alexa is responding, and so on. Buttons for power, mic mute, and volume control are in the center of the device. Polk also provides an efficient remote control that I found much handier than voice commands for simple tasks. Polk’s Command bar setup app is a bit tedious, but it is thorough and idiot-proof. Having experience with smart speakers, I was familiar with the conundrum of a device trying to listen for audio while it’s producing it. At any sort of volume, the waves emanating from the Command Bar tend to obscure those produced by your voice. Solution? Turn down or mute the audio device before issuing a voice command or query, or use the remote control or the speaker’s onboard buttons. Or you can just yell. I’m kidding, that doesn’t always work. With the volume down, the Command Bar does as good a job responding of any Alexa device I’ve tried when it’s not producing sound. If you really want full-time Alexa control, you’ll need a discrete unit that sits close to you. Note that you must create an account with Polk and then use its Polk Connect app to connect the Command Bar’s Wi-Fi adapter to your local network (and from there, to the internet). As is typical, you’ll need to link your Alexa account to your Polk account, so that Alexa can access Polk’s library of commands. It’s a pretty straightforward process, especially if you’ve done this with other Alexa-compatible products. Once you’ve set up Wi-Fi, you can pretty much dispense with Polk’s app, as updates happen automatically. Beyond that, using Alexa is like, well, using Alexa. TechHive has found that while Amazon’s digital assistant isn’t quite as sophisticated as Google’s, it’s a whole lot more ubiquitous, at least for now. 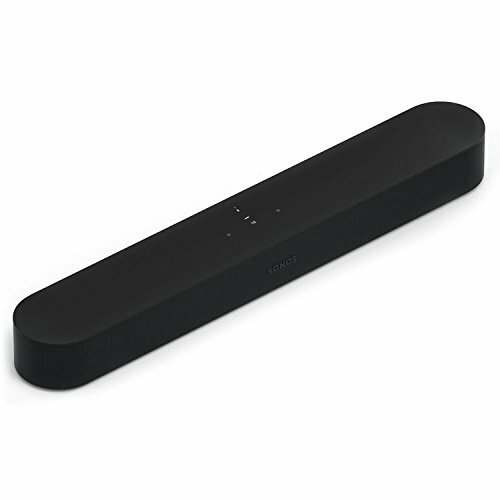 The Command Bar sounds good, with a subwoofer that doesn’t try to overpower you even when cranked to the max. Instead of a treble control, there’s a “voice” control that accents the frequencies of the human voice, seemingly applying some cut to the surrounding frequencies. At least that was my impression. This will be handy for folks with mild hearing loss. 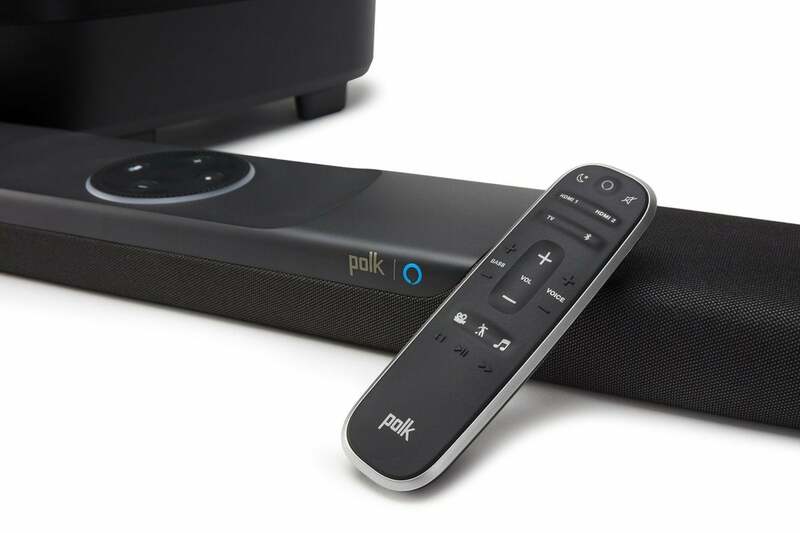 Polk provides a conventional remote control with its Command Bar for those times when it’s easier to push buttons than to talk. I personally would like a bit more top end, but the color of what the Command Bar does produce was definitely to my liking. What sounds good is subjective, so I’ll leave most of that up to you. And each company has it’s own “sound,” if you will. If you like that slightly glassy effect, or the “air” that lots of high-end provides, you should look elsewhere. If you prefer solid mids and nice balance, then the Command Bar should be on your short list. Subjectively, the Command Bar and woofer get reasonably loud, though no soundbar is a replacement for a high-end surround or stereo system. If you’re comparing the Command Bar to a Sonos Beam in terms of features, you’ll need to spend $600 to add a subwoofer to the latter, but you can’t add wireless surround speakers to the former at any price. Sonos also has one of the best multi-room audio systems on the market, and support for Apple’s AirPlay 2, where Polk’s speaker doesn’t support multi-room configurations at all (it might support Amazon’s multi-room tech down the road). If you’re intrigued by Alexa and are also in the market for a soundbar, the Command Bar is as good a way get both in one package. Polk’s speaker is less expensive than a Sonos Beam, and it offers some features that product doesn’t. But the Beam is better for multi-room audio, and it can be built up to a 5.1-channel surround system—though not cheaply. Which features do you find more important?